A new study says particle air pollution causes northern Chinese people to die about three years before those in the southern region. Air pollution in China could be taking years off residents' lives. A study published in the Proceedings of the National Academy of Sciences says people living in northern China will die at least three years earlier than their southern counterparts. In some cities, that's closer to seven years. Air pollution concentration in China's northern region is close to 50 percent higher than in the south. That's partly due to a policy that gives northerners free coal during the winter. China has been trying to tackle the problem. It's switching its primary heating source from coal to gas and electric. The country has also pushed for more regulations. 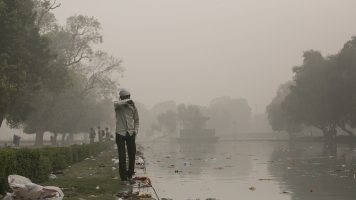 China's Premier Li Keqiang declared a war on pollution in 2014. The following year, heavily polluted Beijing saw the amount of harmful particles in the air drop by 15 percent. China still remains below global air quality standards, but it's hardly alone. More than 4 billion people worldwide are exposed to air pollution levels at least double what the World Health Organization considers safe. One of the study's authors, Michael Greenstone of the Energy Policy Institute at the University of Chicago, said: "Particulate matter is the greatest environmental risk to human health around the world, and most of the damages are occurring in China and India." Researchers used their findings to build an air pollution index that lets people around the world see how much longer they would live if they were to breathe cleaner air. If China were to meet the World Health Organization standards, it would extend its resident life expectancy by over a year.